Central Amusement wants you to join the largest out-of-home interactive entertainment network. 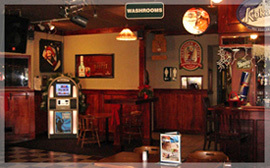 With a music catalog of hundreds of thousands of songs, incredible sound, configurable light shows, and a fun, easy to use touchscreen interface, TouchTunes digital jukeboxes distributed in Atlantic Canada by Central Amusement create a unique, interactive music experience that keeps your patrons coming back for more. 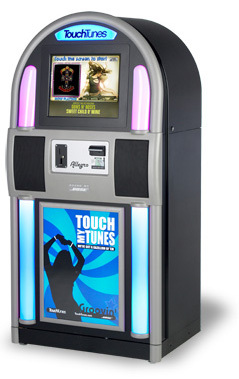 Central Amusement will install and operate a TouchTunes jukebox in your location without any cost, risk, or work for you. You provide the space and share in the rewards. Easily access the online library of millions of fully licensed songs via the easy to use LCD touch screen display. Central Amusement can establish filters for your location that determine what music can and cannot be played. If you really don't like a particular genre of music, a particular band, or even a particular song...these all can be filtered out. If your location has a particular theme (e.g. a blues bar) then the jukebox will only sing the blues. Songs with explicit lyrics can be excluded all together and the song length can be limited as well so you don't have to listen to 15 minutes worth of "Babe I'm On Fire" by Nick Cave and the Bad Seeds. And if a song happens to sneak through that you don't like, your staff have the ability to remotely cancel that song. You have full control. 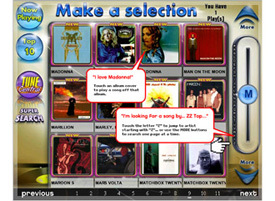 TouchTunes jukeboxes support both Broadband and dial-up connections. Get all the hottest features and capabilities with a Broadband connection or, where Broadband is not available, use dial up to stay connected and keep your jukebox up to date. A dial-up connection does not require a dedicated line. The jukeboxes have a Bose sound system and if you want, Central Amusement can wire them directly into your location's sound system for an enhanced entertainment experience. Central Amusement has experience wiring the jukeboxes into many different satellite music systems. 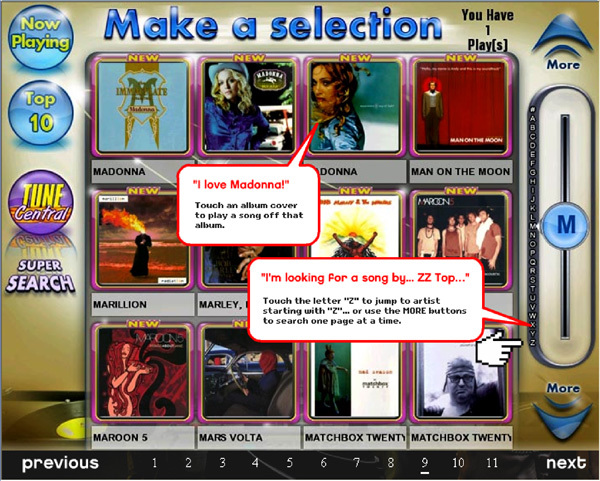 When the jukebox is played, the satellite music volume is automatically lowered and the jukebox music is played. When the song is over, the satellite music comes back up. It's kind of like magic. How do I get a TouchTunes jukebox from Central Amusement? Simply send a message to info@centralamuse.com with the title "JUKE BOXES" in the Subject line or call 1-902-752-6164.